Notes: The published version of this essay appeared in Glass magazine, Summer 2001. 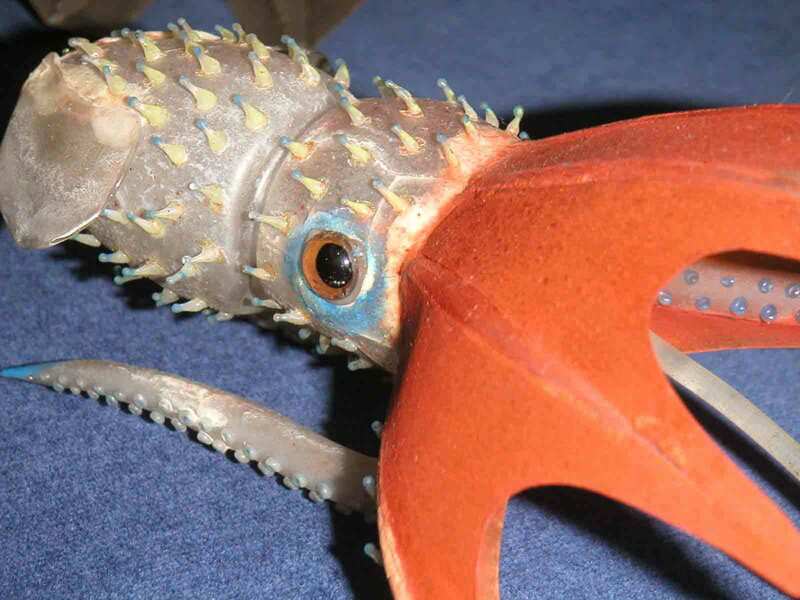 This web version is illustrated with the author's photographs of the Cornell University collection of Blaschka Marine Invertebrate glass models. A second article was published in Ocean Realm magazine (above). See www.oceanrealm.net. Thanks to Professor Drew Harvell, Department of Ecology and Evolutionary Biology at Cornell University, who is in charge of the Blaschka collection, for her advice and support. The images on this page are by William Warmus, made mostly with a Minolta Dimage 7 digital camera. Backgrounds adjusted with Photoshop. In 1928 the naturalist William Beebe described his experiences as a helmet diver in the book Beneath Tropic Seas. Beebe felt that our existing terrestrial vocabulary was an inexact and at times unimaginative instrument for gauging the world beneath the waves. For example, he wrote: "I know the exact shade of a certain feathery sea plume, but resent having to refer to it as zinc orange. Yet I am always pleased when I detect salmon, or pearl-grey or ultramarine." 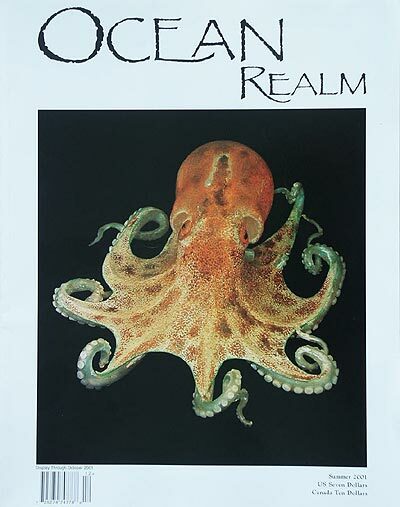 Beebe struggled to present an accurate and poetic account of the fantastic visions presented to him by the ocean realm, but he was not the first. From ancient times to today, scientists, writers and artists have sought to perfect their descriptions of the deep and the creatures that thrive there. The Blaschkas, who made the glass creatures that illustrate this essay, were not the first to make models of underwater life, but they were among the most fanatic in attention to detail. They would have appreciated Beebe's subtlety of observation. During the fall of 1957 an unusual find was made at Cornell University in upstate New York. Professor Thomas Eisner, a young faculty member who was working in Roberts Hall and had begun to explore its musty corridors, found a series of locked antique wooden cabinets. Through the dingy glass windows were visible hundreds of delicate and unusual sea creatures, all the more extraordinary because landlocked Ithaca is several hundred miles away from the closest tide pools. Eisner, now recognized as a founder of the field of chemical ecology, and his graduate student Roger Payne, who later discovered that Humpback whales sing songs [endnote 1], picked the locks with a paper clip and were absolutely mesmerized to find that the highly detailed ocean invertebrates, including octopus, squid, pelagic snail, and sea cucumber, were made of glass. Altogether, 570 creatures had been-well, how had they been?-fashioned by someone, for some purpose. But why? And when? The story begins in the fall of 1882. The president of Cornell, A. D. White, had launched the University on an avid career of institutional collecting that would eventually include everything from the first telegraph receiver to the principal copy of the Gettysburg address (in Lincoln's handwriting) to a preserved manatee and the papier mache models of Auzoux. It was easy, then, for Professor Comstock of Entomology and Invertebrate Zoology to talk White into visiting Ward's Natural History establishment in Rochester, New York. 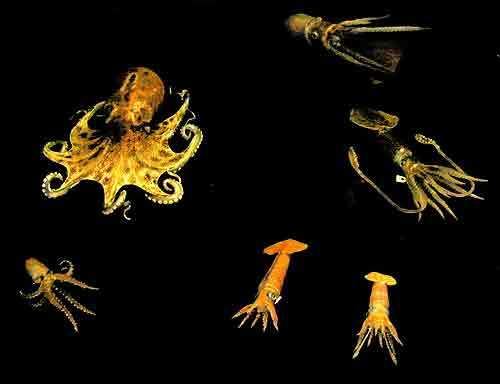 There, they saw the highly detailed teaching models of ocean invertebrates, made by Leopold (1822-1895) and Rudolf (1857-1939) Blaschka of Dresden, Germany. President White was so enthusiastic about the glass models that he authorized the order of a complete set, and increased the annual operating budget for the department, allowing for the installation of running water in the laboratory. The rest is fairly well known. 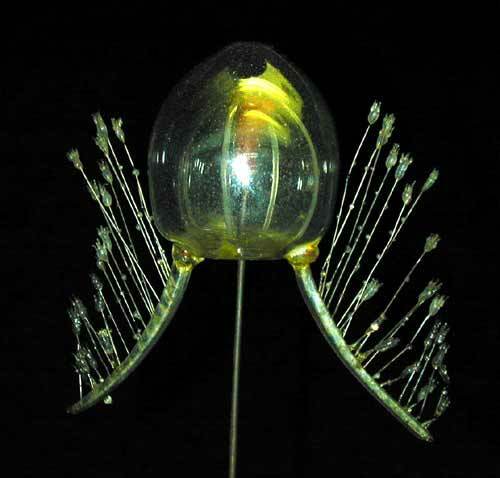 The Blaschkas made educational models for many universities and institutes, including the Zoological Institute in Vienna [endnote 2] and Harvard University, where they were engaged to create a significant study collection of glass flowers. Many of their early marine designs were derived from illustrations available in contemporary books, for example those published in Philip Gosse's famous account A Naturalist's Rambles on the Devonshire Coast of 1853, although later the Blaschkas worked from preserved and live specimens. The advantage to students of studying glass models over preserved specimens was that the preserved specimens tended to lose shape and color. By the time Eisner made his discovery, Jacques Cousteau had perfected the aqualung and the era of gorgeous, full color underwater photography of sea creatures would soon make the scientific study value of the Blaschka models obsolete. But not quite out of date in 1964, when Eisner wrote (with Allison Burnett) the book Animal Adaptation. Lacking good illustrations of Sepia officinalis (a squid), Sabella (a tube-dwelling polychaete), and Arenicola marina (a lugworm), he turned to the Blaschka models. An avid photographer, he made the photos himself and published them in black and white in the book, where they look amazingly like the live creatures, or at least like freshly caught ones. In a certain sense, Eisner's use of the Blaschka models in his book represents the closing of a circle that began when the Blaschkas first turned to Gosse's book as a source for their models. The caption for Sabella in Eisner's book hints at the precise anatomical detail that is visible in the model and was introduced by the Blaschkas: "The front end, beset with feathery gills, protrudes from the tube. The gills are slimy and entrap small organisms that are then conveyed to the mouth by cilia. 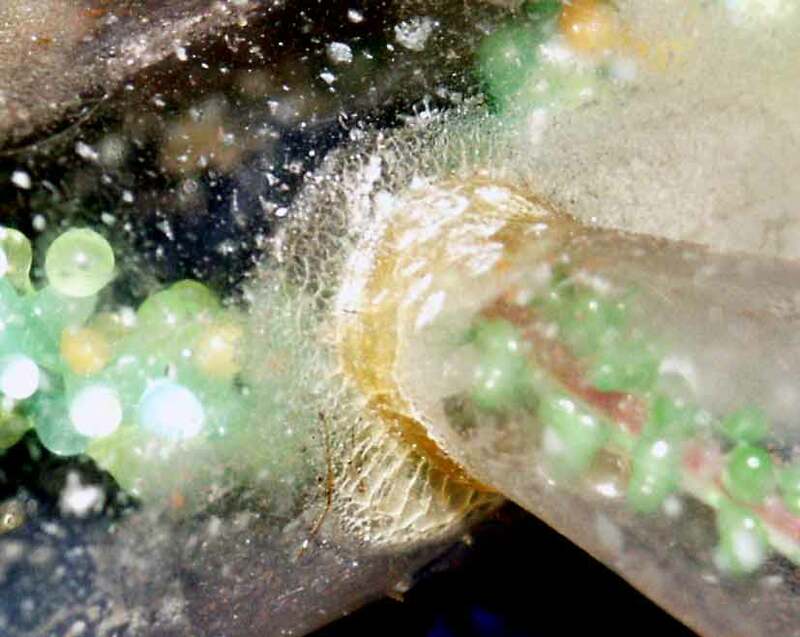 The slender body of the worm is visible (arrow) where the tube has been dissected open." Although Paul Stankard's wildflower botanicals come immediately to mind, I am aware of few artists practicing today whose work could sustain such a close inquiry into its parallelism with natural forms. We live instead in a hit-and-run era, a time when artists brought up on conceptual, minimal and political art use nature as a starting point, but seldom as an end in itself. Today the work of the Blaschkas is seen as a curious fusion of craft and science. Some people love them as both, some people see them as not very good examples of either: obsolete science, high craft, low art. I personally like them because they are objects that exist "between." This undefined flavor seems to me to give them a kind of live independence. The Blaschka models still have a voice for those interested in listening, and maybe even a few new stories to reveal. For example, I have for a long time felt uneasy about what I can only describe as the "dry" aspect of the surfaces of some of the glass models. Then I learned that many were painted (probably cold painted), and this explained why the usual high gloss aspect of the glass had been muted. But I keep asking myself, why would the Blaschkas do that? Why not use a paint that would retain a shiny, wet look? I don't have an answer yet to this question. Maybe the paint is simply dusty and dim with age. But recently, in researching the work of the painter Walter (Zarh) Pritchard, I came across another possible answer. Pritchard was probably the first artist to paint underwater. He took his oil impregnated drawing paper (attached to a sheet of glass) and oil crayons to the bottom of the sea (well, actually only to a depth of fifteen or twenty feet), off the coast of Tahiti around 1905. At first, Pritchard drew only as long as he could hold his breath, diving and surfacing repeatedly, but later he used a dive helmet, the air pumped from the surface. Curiously, many of the resulting paintings and drawings had a "dry" look. A remark he made is pertinent here: "There is no feeling of wetness when one is below the surface." [endnote 4] Wetness is given to us by visual cues-drops of water, irregularities of sheen--that can't exist beneath the waves. This meshes with my own diving experiences. And when glass is immersed in water, it does not have a wet look. I have had the opportunity to work beneath the Pacific Ocean with glass installations by the artists Catherine Rahn and Dale Chihuly: glass surfaces underwater have a beautiful way of melding with the ocean medium. 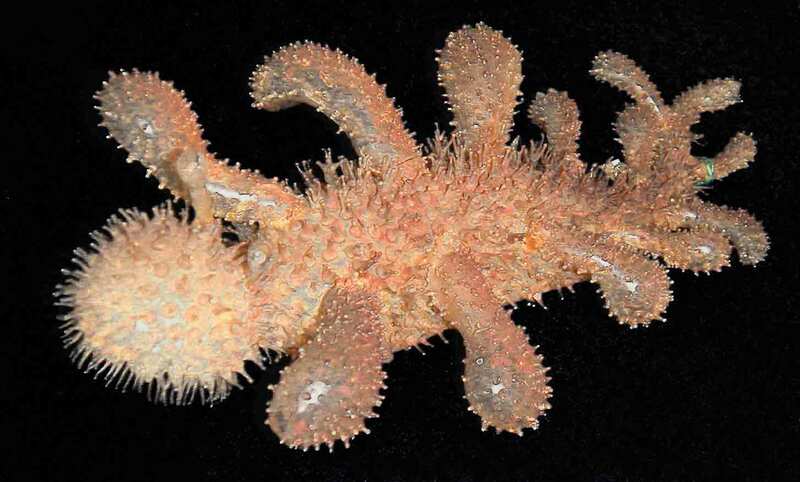 I conjecture that the Blaschkas knew, or intuitively sensed, that their marine invertebrate models need not have a wet look to be accurate to the feel of the ocean realm. Who knows? Maybe they even placed their models in aquariums (a new invention of the era) out of simple curiosity, and learned for themselves Pritchard's profound observation about the terrestrial origin of wetness. But would that sort of observation count as an act of the artist or of the scientist? The Blaschkas worked during an era of tremendous growth in our knowledge about the ocean. Just a generation earlier, in 1861, the writer Michelet had observed, in his book The Sea, that "There are doubtful creatures, the Corallines, for instance, that are claimed by all the three kingdoms." Scientists soon decided that the corals were animals rather than rocks or plants. Today, we are faced with a similar uncertainty regarding certain categories of objects. Which kingdom should lay claim to the Blaschka creatures? Art? Science? Craft? The artist Marcel Duchamp was among the first, around 1917, to show that anything and everything could be experienced as a work of art. Since that time, artists have demonstrated that bottle racks, bricks, piles of earth, ideas, a dead shark, and even craft objects can be appreciated aesthetically. From this situation follows a question: If any thing can be made into a work of art, can works of art be made into anything else? Can the work of art itself be claimed by other kingdoms? For many artists, the answer is no: it is art, nothing else. It is not a brick, it is art. It is not a dead shark, it is art. It is not a bowl, it is a work of art. To put apples in that bowl would be wrong. Art trumps function. In fact, art trumps. Period. Above: This unusual Blaschka glass model from the 1880s is an ocean going Sea Slug that floats upside down as it hunts jellyfish. Glaucus atlanticus is featured on the cover of the 2003 book Deep New Zealand by Peter Batson. I want to revisit the question: If anything can be a work of art, can (or should) it be something else besides? 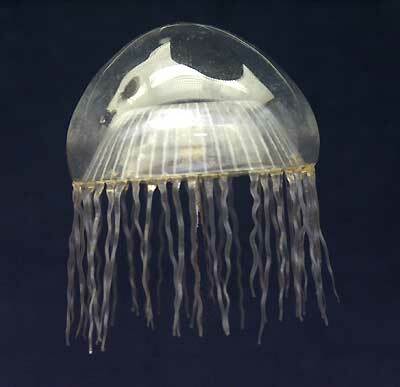 That is why I am writing about the Blaschka Marine Invertebrate models. These objects are sometimes considered works of art. But are they perhaps also something other than works of art? To expand beyond Duchamp, can we claim that there are objects that resist or transcend the ability of the artist to aestheticize them? 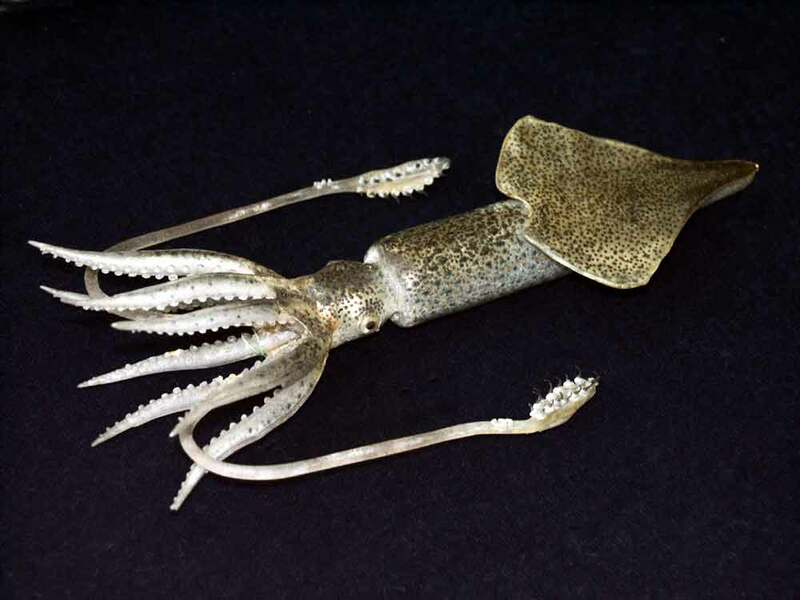 Even if you always harbored doubts about the Blaschka models as art, by 1999 at least one artist had "transformed" them into "art" and received the approval of a leading art museum. In "The Museum as Muse: Artists Reflect" at the Museum of Modern Art in New York City, the artist Christopher Williams exhibited a 1989 photograph of Blaschka flower Model 272 at the Harvard Botanical Museum. As the catalog entry from the Museum of Modern Art exhibition indicated: "By choosing to photograph glass flower models from countries where political disappearances were recorded in 1985, Williams reclassifies them by country of origin rather than by the museum's system. Over the institution's botanical classification, based on science, the artist proposes another, based on politics, underlining the biased nature of any classification system." "Biased" can mean unfair, prejudiced, subjective. Curiously, the credit for Williams' photograph reads "The Museum of Contemporary Art, Los Angeles. The El Paso Natural Gas Company Fund for California Art," reminding us of the biased nature of Williams artwork by reclassifying it and "claiming" it as an advertisement for an energy company. Where does it all end? 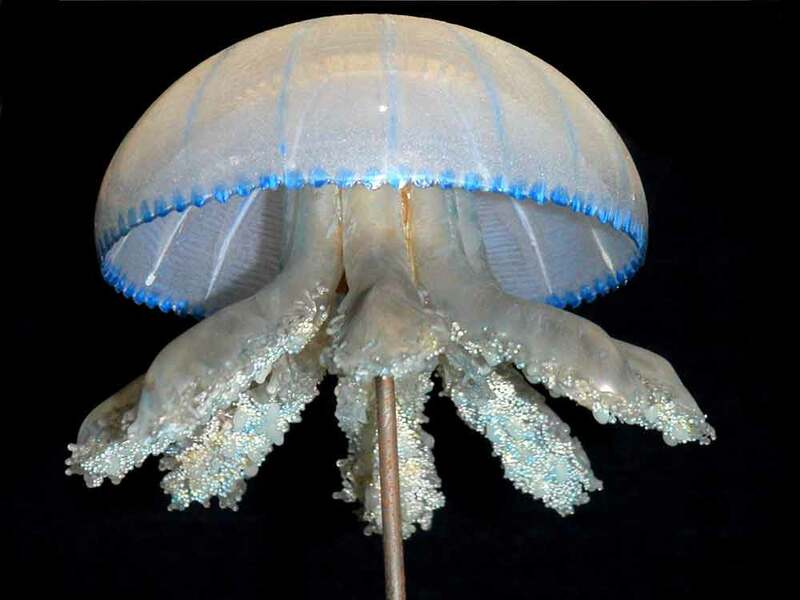 Other artists have chosen to produce fantasy cabinets of objects and labels that superficially resemble the ways the Blaschka models were originally displayed, or, like Damian Hirst, have preferred to immerse real ocean critters in tanks of preservatives. Do these artists know what they are doing? Have they chosen to live in a prefabricated world, detached from the inspiration of anything outside the artworld itself? Perhaps Duchamp made a kind of pact with the devil. In granting the artist absolute power to turn anything into art, he greatly magnified the power of the artist, but also severely diminished the independence of the object. 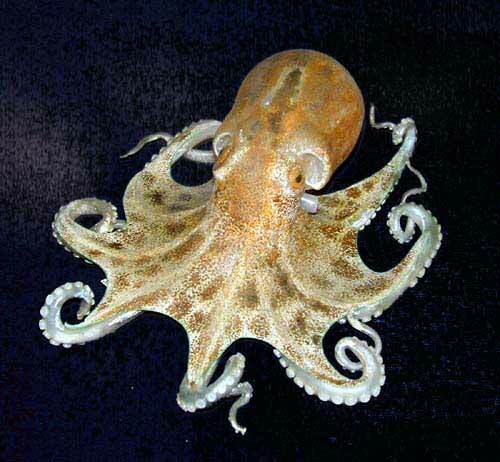 That is why I like the Blaschka creatures. Made at the height of the art nouveau era, they ignored that style's tendencies to exaggerate form and color. Their creators had too many other concerns: were the colors accurate? Are the feathery gills correctly placed on the body? In fact, the absence of "style" in these objects is among their most astonishing aspects. After all these years, they still seem very much alive [endnote 5]. Maybe the Blaschkas never set out to be artists, but somehow they managed to unpickle the fish. Warmus, when he is not writing about art, pursues ocean projects. 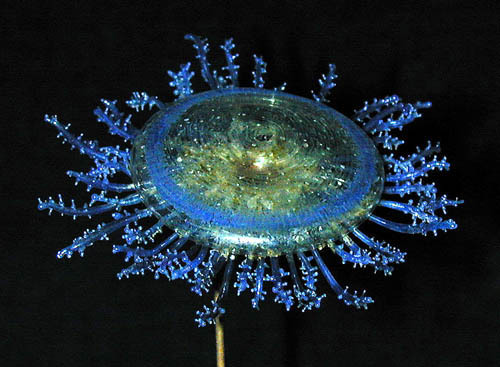 2-The Blaschka images were provided through the assistance of Professor Drew Harvell, Department of Ecology and Evolutionary Biology at Cornell University, and Professor Hans L. Nemeschkal at the University of Vienna, where there are approximately 140 glass models. 3-See David Whitehouse, "The Amazing Blaschkas" in the Glass Art Society Journal, 1990, p.80; David Whitehouse, The Blaschka Animals, Glass no. 44 Summer 1991 p.36; and "The Blaschkas' Glass Animal Models: Origins of Design by Henri Reiling in The Journal of Glass Studies, v. 40, 1998, p 105. 4-Thomas Burgess Take Me Under the Sea. Salem: The Ocean Archives, 1994. P.128. 5- Many simply made glass objects seem to lack "style" because they appear to be products of nature rather than man made. The correspondence between natural process and the activities of the glassblower was perhaps first noticed by Oliver Wendell Holmes in 1859-61 in his novel Elsie Venner: "This was a young man with such a face; and I found,--for you have guessed that I was the "Professor" above-mentioned,--that, when there was anything difficult to be explained, or when I was bringing out some favorite illustration of a nice point, (as, for instance; when I compared the cell-growth, by which Nature builds up a plant or an animal, to the glassblower's similar mode of beginning,--always with a hollow sphere, or vesicle, whatever he is going to make,) I naturally looked in his face and gauged my success by its expression." 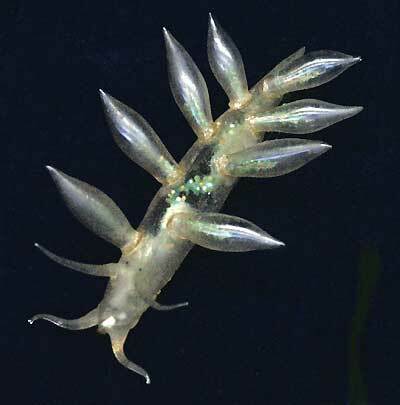 A number of published essays about the Cornell Blaschka models indicate that they were acquired by the University in 1885. My research indicates that some (and perhaps most) may have been acquired in late 1882 or possibly 1883. The relevant published document is the Comstocks of Cornell by Anna Botsford Comstock (1953), page 144, in the section covering the year 1882: "That autumn....The President became enthusiastic over the beautiful models of invertebrates, made in glass....President White went with Mr. Comstock to Rochester to select and buy the glass models." Although there is a letter in the Cornell archives from Henry Ward, Ward's Natural Science Establishment, to Professor Comstock, dated 10-23-1885 that refers to a shipment of glass models, there is also a letter from Henry Ward to President White, written 10-16-1882 that refers to the "beautiful glass models of Jelly-Fishes, Medusae..." and that would seem to confirm the Comstock date. Perhaps Cornell acquired the models in several shipments.